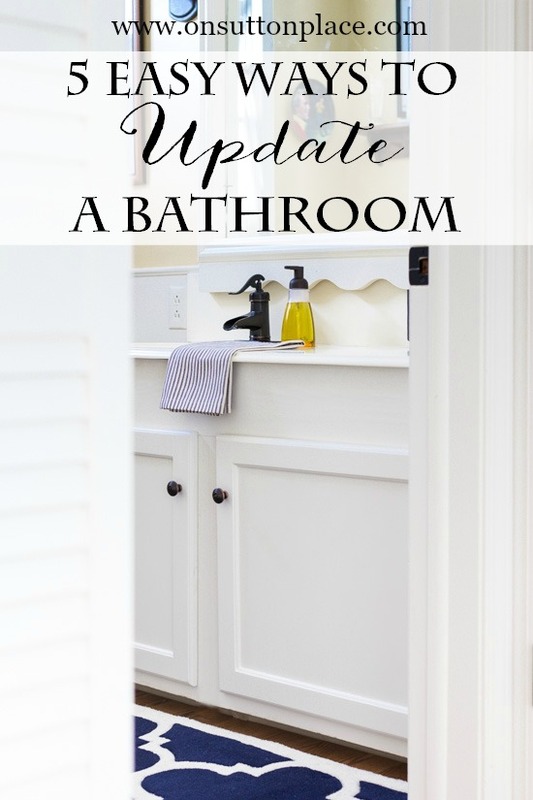 Updating a bathroom is not the easiest thing to do. It’s usually a small room but has pricey elements. By keeping things you already have and replacing others with budget-friendly options, you can refresh any bathroom without breaking the bank. When I told my husband what I was going to do in our half bath, he casually asked if I was going to eliminate all of his golf memorabilia. (I know you are all envious of my Arnie plate.) I assured him that he had nothing to worry about. Everything was going back in except of course the wallpaper. He looked a little sad about that but knew better than to say anything! I didn’t change one accessory or any of the wall decor. That in itself was a huge boost to the budget. The little piece in the corner was my grandmother’s sewing chest. Her brother made it for her in his shop class at school. That had to be circa 1920 or so. I have thought many times about painting it but can never bring myself to do it. I most likely never will. OK…so here is the sad “before.” Dark plaid wallpaper (including the nifty border of famous golf courses.) Chrome fixtures and lights plus ancient broken shutters on the window. 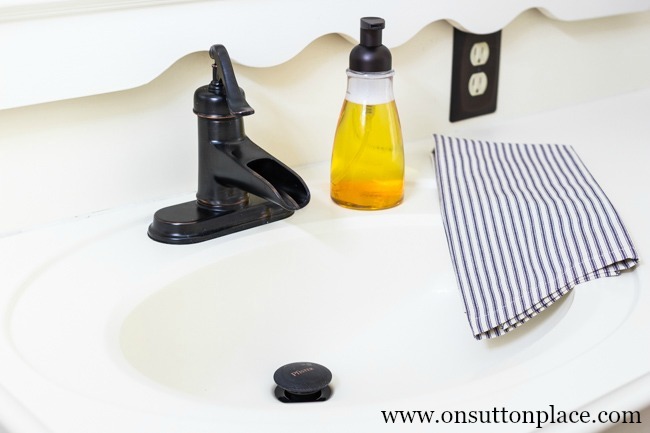 Here are the 5 things I updated to give this bathroom a fresh look on a budget. I will list sources at the end of the post. There is nothing on the planet that transforms a room like a new paint job. You can literally take a really bad space and make it beautiful with nothing but paint. My bathroom is a great example. 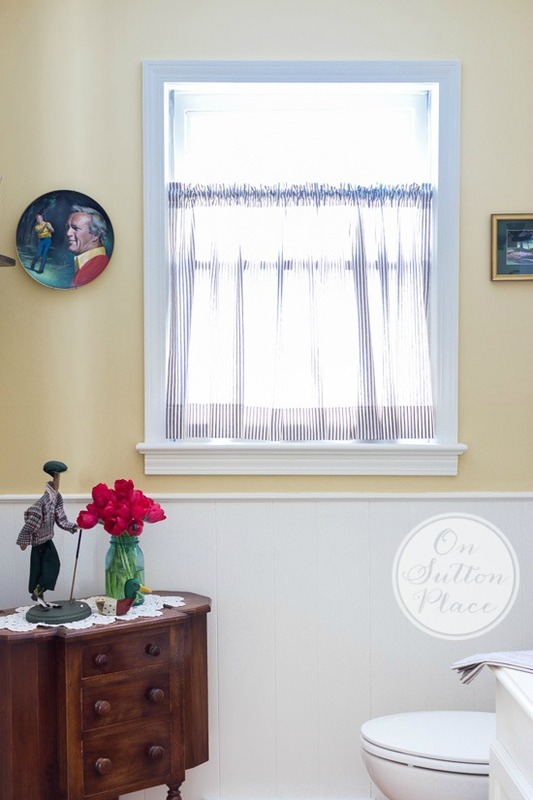 The dark, dated wallpaper is gone and in its place is a soft, inviting yellow. It not only updated the room instantly, but it lightened it up as well. The tired and ugly chrome light fixtures are history. I replaced them with a set of oil rubbed bronze lights I got at Lowe’s for a very reasonable price. Replacing your faucet and all the hardware, keeping it all in the same finish, makes a room look like you planned the design carefully. No one needs to know that you really just fly by the seat of your pants. I replaced the faucet, outlet and switch plates, door knobs, hinges, toilet flusher and toilet paper holder. I got everything at Lowe’s on the same trip I got the lights. Once and done. I removed the awful shutters and made a window panel from blue ticking that just happens to match my tea towels. I left the top part of the window open to give us a little extra light. A tension rod eliminated the need for drilling any holes. Truth be told, I ran out of time and money at the end of this project. It was just before Thanksgiving and I had to get the room finished. I looked locally (not a lot of choice though) but couldn’t find a rug I liked. 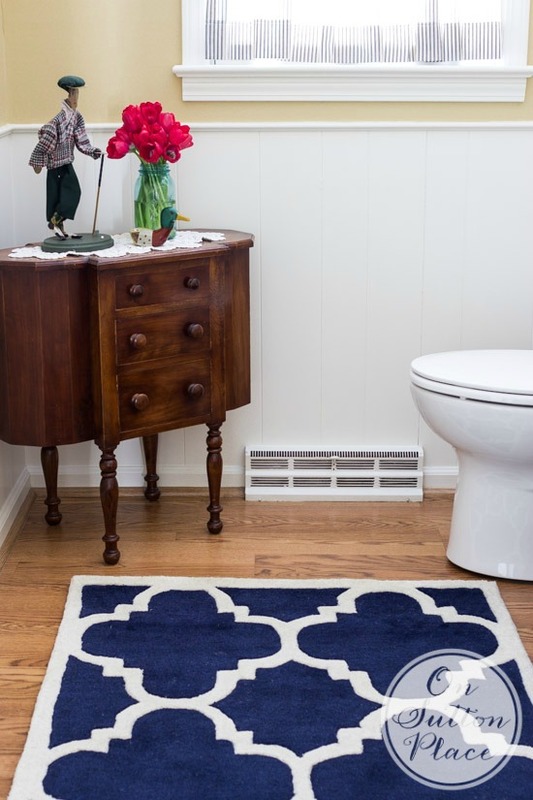 After Thanksgiving, I had time to look online and found this rug by Safavieh called Chatham. I put it on my Christmas list and voila! I had a new rug for my bathroom and I didn’t have to pay for it myself. Most of us have rooms in our homes that we walk by and don’t even see. That was the case with this bathroom. I ignored it for years and I’m not really sure what made me finally decide to update. I’m glad I did though because now instead of looking the other way when I walk by…I look right in and smile. You had before and after pictures of a pink bathroom. It is adorable, I have pink tile and want to do the same flooring. Was this flooring real wood? Hi Donna…no, the flooring is Pergo laminate. I had it in my downstairs as well, but have replaced that with hardwoods. The laminate is still upstairs though. Good luck with your project! This looks so nice.It’s so fresh . Any paint color suggestions for a bath with cream toilet & sink? I have no windows in this bath so it needs some help. I received your post on 02-10-15 & haven’t received one since then. Please ck on this. I checked your info. at my email provider and it looks like you’ve received and viewed all my recent posts. Is that correct? Thank you! I love the update! So fresh and simple. I’m working on updating our bathroom, as it desperately needs help. These tips will come in SO handy! Pinned, thank you for sharing! Ann, I have seen similar sewing cabinets at the auction and wondered if you had one. What a treasured heirloom you have and I would never paint it, either! Your room looks totally refreshed with the changes you made. I’ll have to say that Leo would have been totally at home with the previous decor! You’ll have to tell your husband that he played the Augusta National and it was an incredible experience! He’ll understand, I’m sure! The original bathroom looked like something from the clubhouse. I liked the look; but what you have now is so fresh looking. I have been thinking of updating our bathroom. I have a game plan now that I have seen yours. 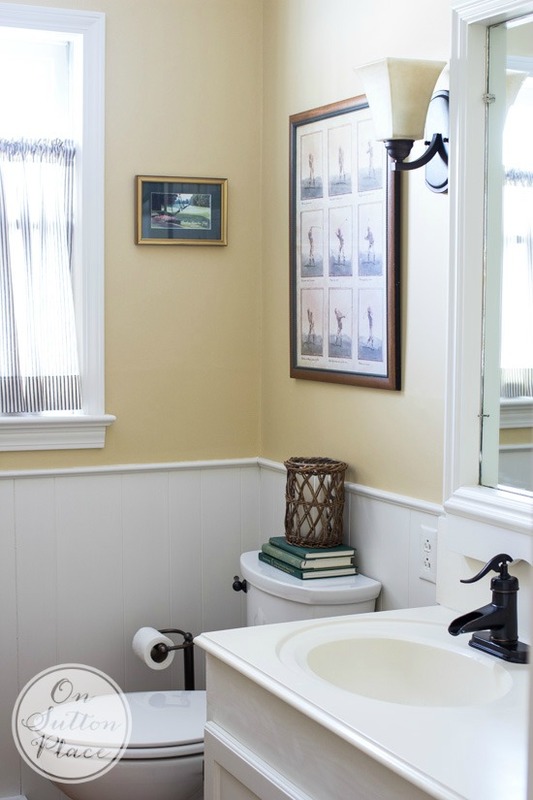 Love what you did to your dark bathroom…I have a bathroom similar in size but it has no window; I am about to begin painting mine and think your color would work in mine..so how could I make mine brighter what kind of pics would you choose…. You most certainly have a true gift for design…..no matter the $$$$$. Some have lots of it but no design taste. You go girl. Just saw its compatible cream. Great color choices! Gorgeous difference! I am inspired to update my tiny little bathroom. Hi Ann, I found this on google and thought you might enjoy a little not about the sewing cabinet also owned be the person that wrote about her cabinet. Hi Leslie! Hmmm. I asked my Dad again where the chest came from and he told me that his uncle made it for his mother. So I’m not sure about it being a Martha Washington or not. My grandmother was born in 1900 so the chest could very well be 100 years old. Maybe I’ll never know for sure exactly where it came from…all that matters is that it belonged to my grandmother. Thanks! Hi Ann! I completely agree with you! It is a treasured piece to have. You made an excellent choice to display like you did. I think I am going to relocate mine, too! Happy Wednesday! Ann, I love your updated bathroom! I was just telling my friend I need to update the look of my kitchen and you just gave me inspiration! I have wall paper thatnisnoutdated and needs to be stripped, I didn’t know you could paint where wallpaper had been, did you prep with anything? I think your sewing basket is beautiful, priceless! Thanks for your wonderful blog, I truly enjoy reading each post! Depending on the shape of your walls after you take the wallpaper off you can for sure paint! Just make sure you get all the wallpaper glue off. Thanks Darla! How did you remove the wallpaper? Hi Connie! I used a mixture of fabric softener and water. Put 1 part fabric softener in a spray bottle and add 3 parts water. Spray your wallpaper really good and let it sit so it melts the glue. Your wallpaper should come right off. Make sure and wash the glue off. If you think you still have glue on your walls you might want to add a coat of primer before you paint. So pretty, bright and sparkling! Love it!! It looks great,you really did a great job.Thanks for sharing with us. 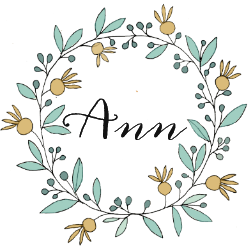 Ann, I think I first came across your blog when I found your post of your bathroom updates for $100. Ever since it’s been on my mind to update my daughter’s bathroom. I have no excuse now not to get on that bathroom done! The bathroom looks nice, and so much brighter. I like that you kept your hubby happy too. Thanks for sharing with us! Dibs on the sewing chest. And the Arnie plate. I am crazy about the blue ticking curtain and towels! And I see the answer on the basket towel rack. That is adorable! Just a few changes and it is so refreshing! The wallpaper change is astounding! Lovely update! I have the same faucet in my half bath. Don’t you love it? It gets lots of comments from visitors. I do love the faucet Sheran! I think it adds just the right amount of character. Thanks for stopping by! Ann- You did a great job!!!! This looks so much brighter and fresher. No more darkness! Just beautiful! I love it! Nice and bright and oh so pretty. What were your walls like under the wallpaper? Did you have to do anything to prep it before painting? Hi Jodi! Way back when we first moved here we removed 3 layers of wallpaper. The walls had to be skimcoated and primed at that time. So when we hung the plaid wallpaper the walls were in great shape. I used fabric softener mixed with water to remove it. Just put 1 part fabric softener in a spray bottle with 3 parts water. Spray and let it sit. Wallpaper should come right off if your wall had been primed or sized. It is beautiful. My all time favorite would be the beautiful little chest you have in there! Isn’t it funny how you can just wake up one day and want to change a room? It’s so refreshing when it’s finished. 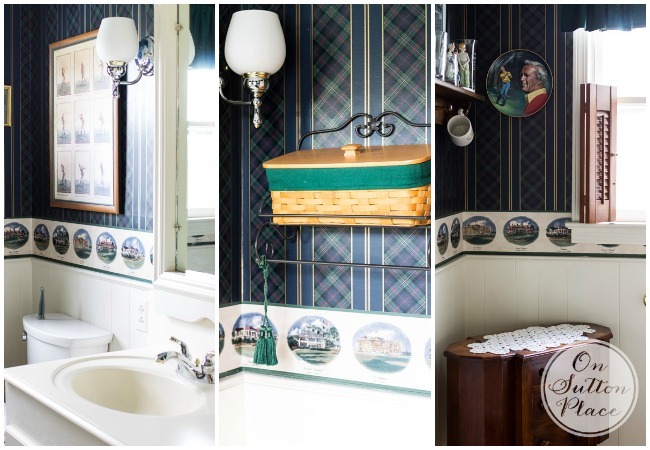 Your little bathroom is perfect with the golf memorabilia and keepsakes. 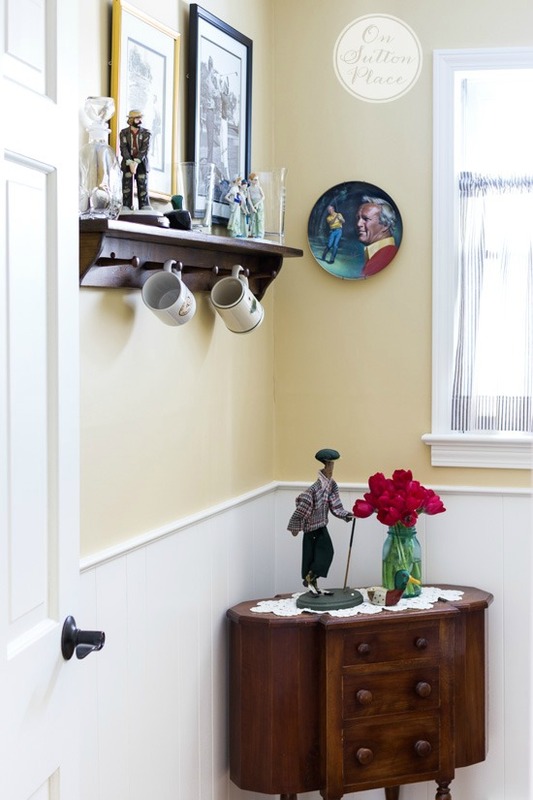 I love the paint and beadboard. Love the new powder room. What is that paint color? It’s so pretty and fresh. Thank you! Hi Amy! The paint is Sherwin Williams Compatible Cream. Thanks! Ann, I love this bathroom fix and am inspired! I want to ask you where did you get the towel bar and basket hanging on the the wall? That would be perfect in my small bathroom! PS I have been reading your blog for the past year and really enjoy it. Love your style, classic traditional with a clean and updated look and reasonable! The basket towel holder is Longaberger from years ago. I did a quick search on eBay and there are a few listed. Great tips and nice bathroom. It would be one my husband would definitely like.! Hi Ellie! Yes it’s not very girly but that’s OK with me…thanks for taking the time to leave a comment! It looks really nice, and cheery and light. There is nothing like a fresh paint job as you say. spend a fortune to have a well decorated home. Happy Valentines day a bit early…………I just love your blog. Happy Valentine’s Day to you too Nellie! Where did you get the soap dispenser Ann? What a fabulous update! Like night and day! I love the sewing chest (I’m with you on NOT painting it. It’s perfect, just as it is!) Fabulous rug. Love those fixtures –and Lowes. Once again, Ann, you nailed it! TY for the inspiration to tackle my own half bath. I love how it came out. I know how you feel – when I redesigned my laundry room it came out so pretty. I had my husband take the door off so I could see it (and smile) every time I would walk by. Love it! I have the exact same sewing cabinet, it was also my grandmothers, I haven’t seen one like it anywhere else! I have only seen a few sewing chests like ours. I think it must have been a basic thing people made back then? Not sure but am glad I have it. I’m pretty sure that is Longaberger. It does look nice doesn’t it. What wonderful changes you made in that bathroom. It is so light and bright. Thanks for you great ideas because I need to do some of the same things but haven’t got the courage yet. By the way, my husband and grandkids love your oatmeal peanut butter bars. Me too! The basket towel rack is Longaberger from a long time ago. Here’s a search link from eBay where there are a few listed. Thank you so much for the information. I’ll see if I can snag on off of E-Bay. I love that you are familiar with and use timeless Longaberger products in your home (i.e. 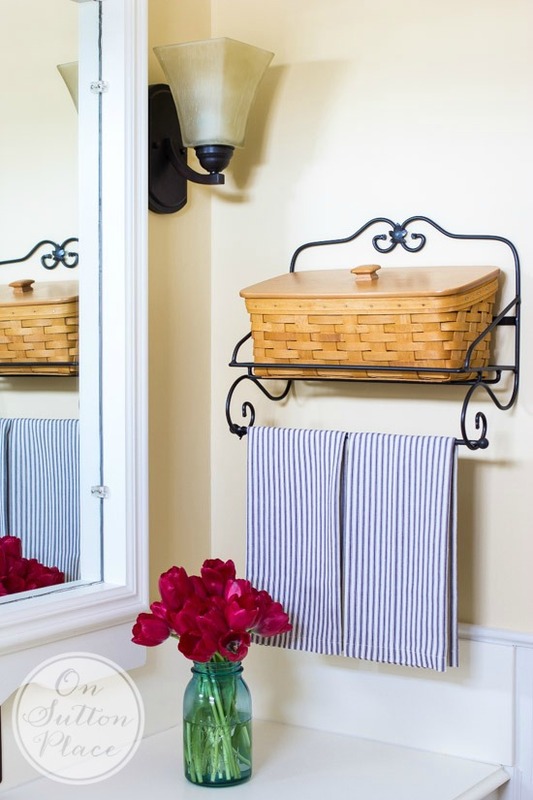 in this bathroom: Vanity Basket Lid and Wrought iron Rack). Did you know you can easily change the “flavor” of the baskets (lids too) with a little paint! Spray paint, or Annie Sloan Chalk Paint (even the waxes for depth and dimension)! Hi Mary…I honestly never considered painting a Longaberger basket. I like the idea though and thank you for sharing! Your bathroom remodel and paint job looks marvelous! Love how much lighter it is now. Also love the table your brother made; what a wonderful family heirloom you have. I’d be afraid/reluctant to paint it too. It looks amazing just as it is. I found an amazing rug for my bathroom at IKEA, however it is not washable either and I’m afraid it will get stained and I won’t be able to spot clean it. It wasn’t expensive, so that’s a bonus. It looks wonderful, Ann! It’s amazing what just the paint alone did, not to mention everything else. Much lighter & brighter now! I love this blog, I get so many ideas that I can actually do. I love how the new paint brightens the room. I had that cabinet too, my grandmother always referred to as a “Martha Washington), it was black walnut. It is a sewing cabinet. Here in the East I see them frequently in consignment shops. Hi Susan! Thank you for the info on the sewing cabinet. I have never heard it referred to as a Martha Washington! I am so glad I have it.